I don't typically do "throwback Thursday" posts (not even on social media), but I thought this particular one would be a bit fun and hopefully spark some discussion, as it deals with creating maps for fantasy worlds. Over the summer, my dad moved out of the house that he'd been living in since around 1991/92 or so. I lived in this house for only a few years, while I finished college and started my job, but I had moved all of my old stuff into the house and much of it did not come with me when I moved out in 1995. Over the years, tons of my old stuff has been safely tucked away in my old bedroom, in the closet or garage, untouched for the better part of two decades. I am, for better or worse, a bit of a pack rat. I tend to carefully pack things away rather than get rid of them, mainly from a weird sense that one day in the future, my descendants can get a better sense of the type of person I was based on the things I collected rather than just from the occasional picture or greeting card. My family on both my mom and dad's side kept very little in terms of personal keepsakes or mementos, and both families went through a very significant purge when they moved from the South and Midwest and made their way out West in the 1940's or before. As part of my mom's genealogical research, I have a pretty long collection of names and dates of my ancestors, but very little that tells me what kind of people they were. 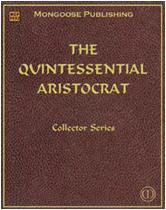 This was always very frustrating to me as I grew up, and I believe contributed to my personality quirk of never wanting to part with my things; I have this feeling that some day, someone might want to know that I read a certain book, or wrote or received a card from someone, or that I drew a picture or map, or that I played D&D or Warhammer 40k. Cleaning out my dad's house was a huge task that included going through not only my old stuff but also my mom's, grandma's, and uncle's possessions, all of whom had already died and whose things had been boxed up and packed in the garage at my dad's house for years. It was a monumental undertaking that took weeks, and we ended up throwing many of the things out (much to my chagrin) due to lack of time, and throwing a lot more of it into a storage unit (family photos, a couple of pianos, etc.). students and friends in my Third period Spanish class. While focusing on cleaning out my old closet and boxes in the garage, I found a bunch of my old notebooks from high school and college. Yes, I know it might sound strange, but I actually kept all of the notebooks that I used to take notes during class, and even all of my old paperbag book covers that I used on my school textbooks (mainly because I drew pictures all over the book covers). One thing I was happy to discover during this process was a bunch of old maps I had drawn in various classes. 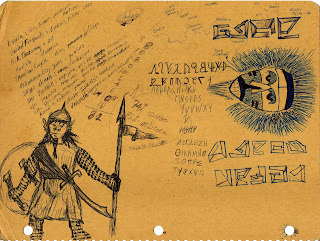 I used to love doodling during class to pass the time, and I would create maps of fantasy worlds based upon the people in the class I was in, and then I would develop the political history of the region based upon the relationships of the people in my class. I'm sure I'm not the only person who ever did this, but I've never talked to anyone else who did this. I found two of these maps in my old notebooks, which I've enclosed here with this post. 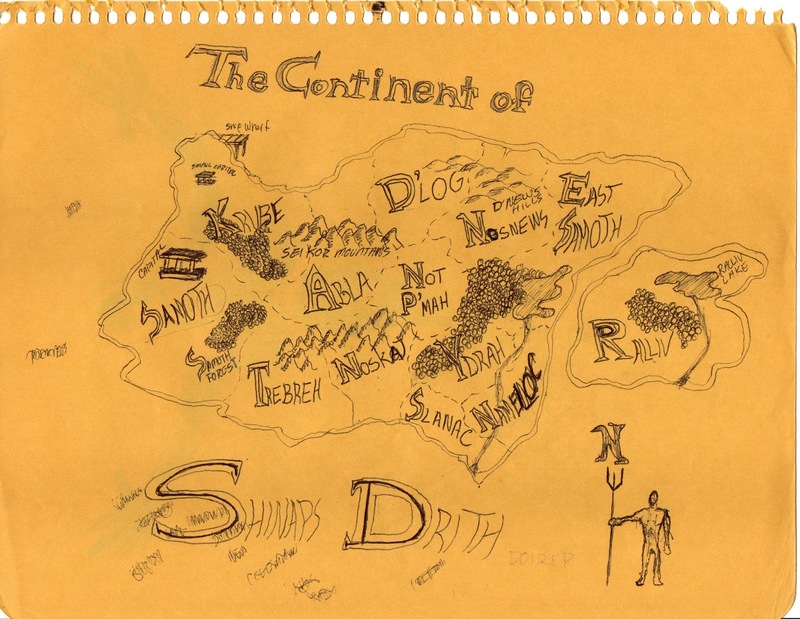 One of them that really cracks me up is "The Continent of Shinaps Drith" which was based on the students in my Third period Spanish class (I took a lot of my naming conventions back then from Gary Gygax). 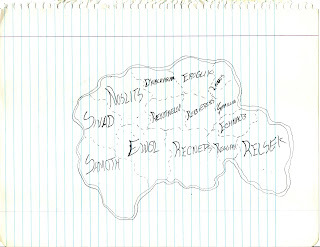 Looking closely at the map, you'll see a country named "Samoth" and another one named "East Samoth" (tweaks of my last name); this was a very early proto-campaign that morphed with a few other maps and notes I had that eventually evolved into my World of Samoth campaign, which I've been running since May of 2001. In addition to maps, I would make notes, and the back of one of my notebooks included notes on various countries I was planning on developing into a campaign world. The picture that includes a sketch of a goblin with a spear would have been from my sophomore year of college around 1990 (I can tell because I took Ancient Greek for my language requirement that year and I was clearly experimenting with some of those letters), and it also includes the start of a list of countries including Esoría, the Holy Ætonist Theocracy, and Kovlich, all of which became part of my campaign world. The small map to the upper right might be one of the first (at least, that I can still find) maps of my campaign world. 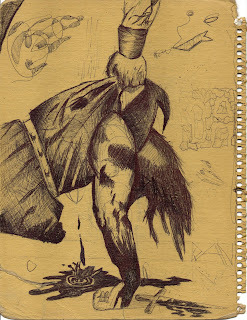 Lastly, just for fun, I also included a drawing I made on the back of one of my notebooks. This was based on a drawing from one of Marvel's old Conan comics, from around 1987 or so. Despite what it may look like from all of the drawings I made in my school notebooks, I actually did quite well in school. We moved around a lot and by the time we moved to where we lived when I made most of these drawings, it was in the middle of high school (my dad got transferred between my Sophomore and Junior years in high school) and so I was constantly the "new kid" and would spend a lot of time drawing and working on a campaign world even though I didn't have anyone to play with because it always took me forever to make friends. My drawings were my passive-aggressive way to get people to talk to me. I was really shy, but I figured if someone saw me drawing, it might be an ice breaker to a conversation. It worked sometimes but backfired a lot more as I got labeled as "that weird kid who draws maps and strange creatures." 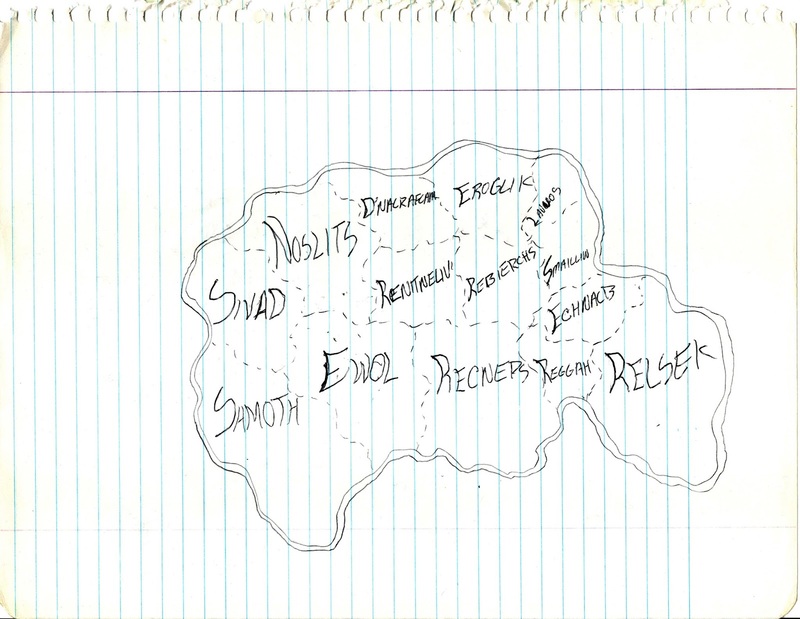 Anyone else out there used to draw maps in their school notebooks, and did you ever base the politics of your worlds on the relationships of people in your class? 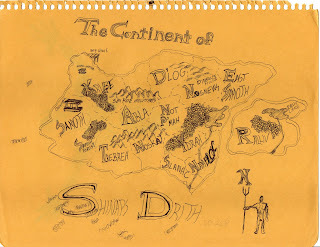 For more info on my World of Samoth campaign, you can of course on the World of Samoth tag, and also read this post celebrating my 14th year of DM'ing my campaign back from May 2015 which includes a bunch of my drawings from my campaign notebook. Man oh man, these are pure gold, my friend! They are filling me with nostalgia for the halcyon days of old from my own time gaming in the late 80's and 90's! They also remind me of the drawings from the Napoleon Dynamite movie, but way better quality in terms of drawing talent! Thanks for sharing these! I'm very happy you found these, the discovery must have been an awesome nostalgia trip! Thanks so much, Anthony! So great to hear from you. And thanks for the compliments on my drawings. Unfortunately I don't really draw a much any more, so my illustration muscles are definitely lacking these days. And yes, it was awesome to find these. I always thought in the back of my head that they were still there somewhere, but I wasn't sure exactly what I would find after all these years and whether my mind was playing tricks on me as far as what I thought I'd kept. Nice to see your nostalgia - and looking forward to more posts in the coming year! I'm hoping to blog more this year than last, so stay tuned.